The so called ‘capital key’ used by the European Central Bank is due to be reviewed. Sebastian Diessner explains that while in the past this has been viewed as a largely technical process, this time around the issue will have heightened political significance for two reasons in particular: the UK’s upcoming departure from the EU, and the current stand-off between the EU’s institutions and Italy’s government. 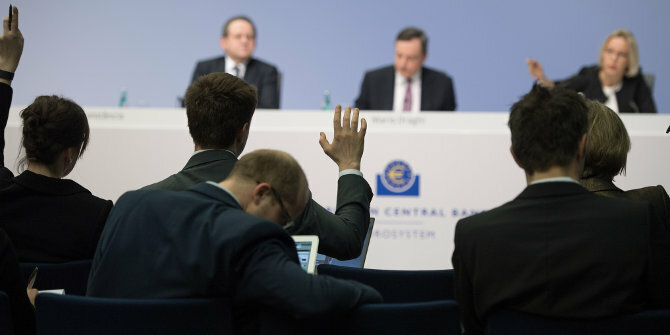 The cottage industry of ‘ECB watching’ has seen a steady rise in activity over the years, with every aspect of the central bank’s policy-making and deliberation now under increased scrutiny from a range of different audiences. One of the more ‘obscure‘ technical details to watch out for these days is that of the ECB’s capital key. In simple terms – and for those less enthused by central bank day-to-day practicalities –, the national central banks of all EU member states effectively act as the shareholders of the ECB, and the size of their shares is determined by the capital key, which in turn is derived from the respective sizes of EU national economies and populations (amounting to a total of just under €11 billion in subscribed capital for the central bank). While euro area central banks have to pay up their shares in full, non-euro area ones (such as the Bank of England) are required to deposit only a fraction of their subscriptions. Every five years, the ECB reviews and adjusts the capital key in order to reflect economic developments in member states over the previous five-year period. The latest review is due to take place before the end of this year. In the past, few would ever have noticed this process – or, as one slightly less enthusiastic ECB watcher puts it, ‘these are technical issues that usually nobody would care about‘. But this time is different. When Europe’s monetary policy-makers convene these days to discuss the necessary capital key adjustments to be made – presumably first at the imminent General Council meeting on 6 December, and then at the Governing Council’s monetary policy meeting with subsequent press conference on 13 December – two incidental political developments will have to enter the supposedly technical calculation: the advent of Brexit, and the looming conflict with Italy’s populist Lega/Five-Star government. In terms of the latter, the capital key has gained prominence over the last few years due to its centrality in the ECB’s quantitative easing programme: at least in principle, government bond purchases under the programme are determined by the key (with the majority of purchases being conducted by national central banks). When the ECB announced this past summer that new purchases would be discontinued at the end of the year, it equally emphasised that it would nevertheless continue to reinvest the principal from bonds it will already have bought until then. Avid ECB watchers have labelled this manoeuvre the ‘dovish taper‘. Ever since, however, they have been left guessing about the exact criteria according to which these reinvestments would be made. The natural candidate is – you guessed it – the capital key. However, the readjustment of the key comes at a very particular time, namely one in which the EU increasingly finds itself in a stand-off with an Italian government that has already formulated direct accusations of being disadvantaged by the ECB’s asset purchase policy. If the capital key is now re-weighted to reflect the relatively solid growth developments in Germany over the last five years, and decidedly more sluggish growth in Italy, for example, this may signal that more German bonds will eventually be purchased vis-a-vis Italian ones, thereby possibly affecting already jittery financial markets. No matter how small this readjustment would actually turn out to be, it may well provide further ammunition for a recalcitrant government that seems firmly set on a collision course with the rest of the EU. Arguably of equal importance to the ECB, yet relatively rarely discussed, is the advent of Brexit. In essence, the UK’s departure from the EU raises the question of what ought to happen with the Bank of England’s share in the ECB’s capital. That question is somewhat analogous to the conundrum of the EU budget, namely of who will step up and fill the Brexit-sized hole in the EU’s next Multi-annual Financial Framework once the UK bows out. Will the gap have to be filled by the remaining EU member states’ central banks collectively (which all contribute to the ECB’s capital base), or only by the eurozone members (who are the ones subject to ECB monetary policy), or only by non-eurozone ones (given that it is a non-eurozone member that is leaving the EU)? To be sure, any potential shortfall in the ECB’s capital would be of a relatively small scale: in total, the Bank of England’s paid up share only amounts to a mere €55 million, i.e. just over 0.5% of total subscribed ECB capital (while its overall share in that subscribed capital is 13.67%, or just shy of €1.5 billion, given the size of the UK economy). In both cases – Brexit and the end of QE – the actual magnitude of the problem thus appears relatively small. So why bother? The short answer is: apart from its actual size, there also is a more symbolic quarrel over the ECB’s subscribed capital. On the one hand, some argue that the mere suggestion that a central bank would need any subscribed ‘capital’ is nothing short of bizarre: after all, central banks are endowed with the legal monopoly to create money, and therefore should not have to depend on anybody else’s money in the first place. On the other hand, the argument goes, central banks should care about their capital in order to safeguard their independence. In case the bank were to make losses from some of its operations, it is the capital base and other reserves that can provide additional buffers against political interference: if, for instance, the government had to step in and rebuild the central bank’s capital, it may do so only under strict conditions that could undermine the bank’s autonomy. For those latter reasons, the ECB might have kept a very close eye on the recent experience of another supranational financial institution: the European Investment Bank (EIB). When the EIB proposed that the capital shortfall that it is going to incur due to Brexit be compensated by its remaining shareholders (i.e., EU governments), no less than seven member states were quick to respond by demanding a profound reform of the bank as a precondition for any fresh capital to be provided. In light of all this, what could be the way forward for the ECB? Among the menu of more or less palatable choices that might be on the table these days, one option would be to adjust the capital key only very gradually over the next couple of years, so as to make a quantitatively small issue look even smaller. Yet another option would be to postpone the decision until the UK officially leaves the EU, or even to push the question into the transition period. A more comprehensive solution would be to reach an explicit, inter-institutional agreement between the ECB and eurozone governments in the Eurogroup so as to obtain some form of political guarantee for the central bank’s capital (as recently exemplified by the Bank of England’s Memorandum of Understanding with HM Treasury). This could also allow the ECB’s seigniorage profits to be redirected towards the EU budget instead of its current shareholders (an idea recently floated by the European Commission), or even towards a eurozone fiscal capacity within that budget (as finally agreed upon by the German and French governments). In a way, however, the most radical step for the ECB would be – paradoxically – to do nothing at all. That is, to not replenish its subscribed capital once the UK has left the bloc, and thus to slowly begin to stop caring about (the size of) its capital base altogether. While the current context indeed creates a unique opening for such rethinking, it is far from certain whether ECB decision-makers can agree to undo the symbol of central bank capital just yet. Instead, the upcoming decision-making meetings may rather yield a compromise that optically preserves the status quo, while postponing any real decision to some later stage. A fudge of this sort would probably sound familiar to policy watchers on both sides of the channel. Sebastian Diessner is a PhD candidate in political economy at the LSE’s European Institute. His research interests include central bank independence and accountability, Eurozone macroeconomic governance, financial regulation, and quantitative and qualitative methods in the social sciences.